We produce complete bespoke exhibition stands including all accessories such as graphics, seating, illumination, desks, point of sale, etc. Starting from initial consultation and design followed by full manufacturing specification and budgets, we will liaise for sign-off with the exhibition company and site management to ensure full compliance with all regulations. Build and breakdown dates are agreed in advance and will be within the agreed timetable. Why look the same as everyone else when you can let your stand draw people in and sell your products? 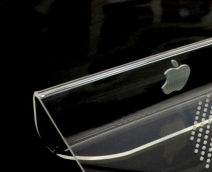 Have your logo on one of our bespoke Laptop stands.